I agree that poetry is killed by incompetent teachers. But if you have ever had a competent teacher, with a heart for poetry, and the voice to go with it, who did not try to elicit your OPINION or your FEELINGS and have them match his or her opinion and feelings, then possibly you – as well as the rest of people in this string – would have a chance to experience what poetry CAN do, but does not always do. Much in the same way that the same ingredients can become an excellent meal in the hands of an inspired, attentive cook and a-dog-wont-eat-this-“meal” in the hands of a person, who is not attentive or doesn’t like cooking. Speaking as a writer of poetry: There is nothing inherently bad about poetry. Nothing to be understood or felt that you would not put your mind or your heart to understand in any other context. Looking from the outside, as a reader, poetry will always be about existance: Existance as in memory and projection, desires and needs, cost of living and loving, has and has not, pain and lessons learned, function and dysfunction, insights and mirages, breath, rhythm and beat, precision and overview, essence and detail, the loss and sought re-aquisition of innocense, hope and dispair, overwhelming emotions of like and dislike… the list goes on. Poetry is about being human. About the games people play. About living with the knowledge that life is brief. Teachers do their best. But there are good teachers and bad teachers, too. And the bad teacher you can rightfully hate: The person who wants you to be like them. Just don’t take it out on poetry. Poetry is everyone else. 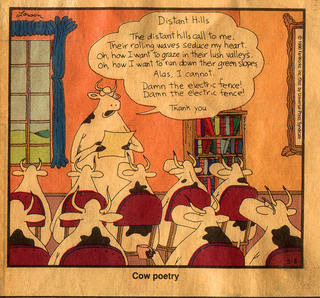 via My blahg: Why I Hate Poetry.